December 1, 2005 The dream of building a manned deep ocean research submersible first started to move toward reality on February 29, 1956. Allyn Vine of Woods Hole Oceanographic Institution (WHOI) attended a symposium in Washington, where participants drafted a resolution that the U.S. develop a national program for manned undersea vehicles. From this beginning the community eventually obtained the Triestebathyscaphe, but it was quite large and not very maneuverable -- a better craft was needed. The firm of Hahn & Clay, under the direction of Larry Megow, fabricated three 6-foot diameter HY-100 steel spheres for General Mills in December 1962, and cut the window holes in the spring of 1963. 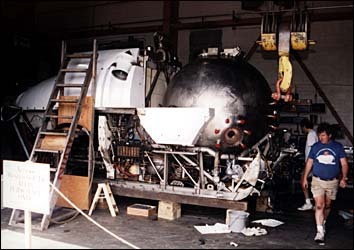 Spheres 2 and 3 were later used for the Navy’s Sea Cliffand Turtle. No one at that time knew the true capabilities of the spheres, so they built three for redundancy. One was to be tested to destruction in February 1964, and plexiglass windows were installed by Southwest Research Institute. The test chamber, however, proved to be inadequate: the chamber lid blew off at 9,676 feet equivalent pressure! Meanwhile, the Woods Hole operational team had begun to form, calling themselves the Deep Submergence Group. 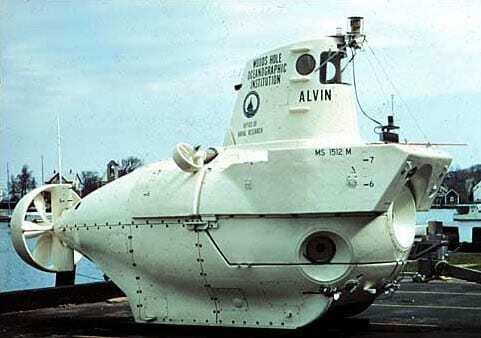 They started using the name Alvinfor the sub to honor the prime mover and creative inspiration for the vehicle, Allyn Vine, a scientist at Woods Hole Oceanographic Institution. The name also benefitted from belonging to a popular cartoon chipmunk, but Allyn Vine was the true namesake. Litton Systems took over the building of the Alvinand on May 26, 1964 delivered it to Woods Hole, where it was commissioned on June 5. Froehlich, Vine, and pilot Bill Rainnie made the first two dives. There were a total of 77 shallow, tethered dives in or near Woods Hole to maximum depths of 70 feet, with the first free dive of the submersible taking place on Aug. 4, 1964 to 35 feet. In 1965 a local Cape Cod craftsman constructed the sub’s first tender from a pair of surplus Navy pontoons, and the catamaran Lulu(named after Vine’s mother) was born. In March Luluand Alvinheaded off on their first voyage to Andros Island in the Bahamas to inspect the ARTEMIS underwater listening array at Tongue of the Ocean, which was the original justification Momsen had used to obtain funding for construction. They first stopped at Port Canaveral for trials, then moved on to the Bahamas where they made a successful 12-hour, unmanned tethered 7,500-foot test dive. Alvinnow had two pilots, Rainnie and Marvin McCamis, and on July 20, 1965 they made their first 6,000-foot dive for the Navy to obtain certification. The following paragraphs give a brief description of annual activities since those early years. An Air Force B-52 and a tanker collided over Spain, dropping an H-bomb in the Mediterranean off Palomares, Spain, in January. The Alvinteam was selected to attempt recovery in conjunction with the Navy's CURV towed vehicle. In February 1966, Alvinand its support vans were loaded into two Air Force cargo aircraft at Otis Air Force Base and flown to Rota, Spain. During the next two months, Alvin, operating from a Navy LSD, searched the ocean floor off Spain for the lost H-bomb. The bomb was located for the first time on March 15, but was subsequently lost during an attempt to attach lift lines. The bomb slid down-slope to deeper water, and the search continued. The bomb was relocated on April 2 and recovered by CURV April 7. Alvinreturned to Cape Cod for completion of the overhaul begun before the Spanish adventure. Alvinreturned to the Bahamas for Navy dives with subsequent transit north for biology/geology dives on the Blake Plateau and off Cape Charles. 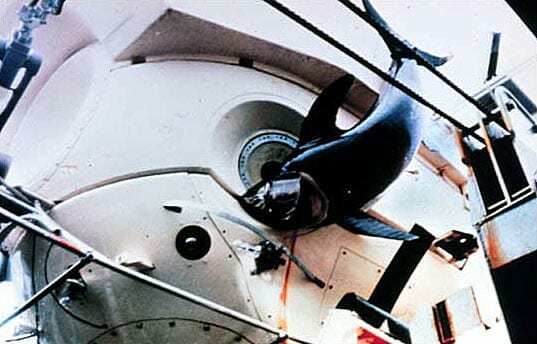 During Dive 202, on July 6, Alvinwas attacked by a swordfish on the bottom at about 2,000 feet. The fish became trapped in Alvin’s skin and was brought back to the surface (and cooked for dinner). Alvincompleted a series of dives south of New England in the canyons and along the continental slope for geology, biology, thermal studies and sound measurements. On Dive 209, in the Hydrographer Canyon area, a Navy F6F aircraft was found, photographed, and surveyed. It was later identified as being lost overboard from a carrier during practice runs in 1944 (the pilot escaped). A series of dives were made to look for submerged whales, Navy dives surveyed the tops of seamounts for a new acoustic test range and geology and biology studies were completed. During the launch for Dive 308 on October 16, Alvin’s cradle support cables failed and Alvinslid into the water and sank to the bottom in 5,000 feet of water. Ed Bland, pilot, received some bruises and a sprained ankle while exiting from the sub. Poor weather conditions and insufficient recovery equipment prevented recovery during the remainder of the year. Alvinremained on the bottom until Labor Day. 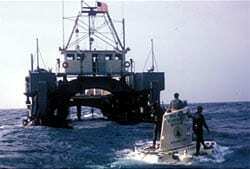 The DSVAluminaut(a submersible from the Reynolds Aluminum Company) and the R/V Mizarassisted in the recovery, which required placement of a lifting bar into Alvin’s hatch (Aluminautpilots had to break the sail in order to accomplish this). Mizarthen raised Alvinto 50 feet, where divers wrapped the sub with lines and nets to prevent loss of any pieces. Alvinwas towed to Martha’s Vineyard, where a crane mounted on a barge pulled it out of the water. Overall, there was very little structural damage to the submersible (except for the sail). Lunches left on board were soggy but edible. Discovery that near-freezing temperatures and the lack of decaying oxygen at depth aided preservation opened up new areas of biological and chemical research. Alvinunderwent a major overhaul after its ten-month dunking. The Gulf of Maine and the Straits of Florida provided sites for the next series of dives. On Dive 364 Alvinwas attacked and hit by a large blue marlin while on the bottom off Grand Bahama Island. The fish did some damage to the underwater lights and sail and much damage to himself. During the spring, a new titanium pressure hull and variable ballast system were installed. After a series of simulated dives in a Maryland pressure test tank, Alvinwas officially certified to 12,000 feet. Project FAMOUS (French-American Mid-Ocean Undersea Study) provided our first close-up look at the Mid-Atlantic Ridge along with the French submersibles Cyanaand Archimede. National Geographic ran articles on the Project in the May 1975 issue, authored by WHOI scientists Bob Ballard and Jim Heirtzler. Alvincompleted a series of dives in the Bahamas (biology), at Grand Bahama Island (geology), Blake Plateau (biology), and made a radioactive waste dump site survey. A new deep (12,000 feet) bottom station south of Cape Cod was established. Alvinwas certified for 4,000 meters (13,124 feet). A series of geology dives took the sub to the Cayman Trough, and Navy dives were made near St. Croix and Tongue of the Ocean. Biology studies were carried out on the shelf, slope, and canyons south of Cape Cod. A waste drum was recovered from the radioactive waste disposal site off New Jersey. Alvintraveled through the Panama Canal for the first time. Geology work in the Galapagos Rift was completed during February and March. The major discovery of an abundance of exotic animal life on and in the immediate proximity of warm water vents prompted theories about the generation of life. Since no light can penetrate through the deep waters, scientists concluded that the animal chemistry here is based on chemosynthesis, not photosynthesis. Return passage was made through the Canal for April dives in the Cayman Trough (a continuation of a geology investigation). During this series a Nicaraguan earthquake occurred and was plainly felt by Alvinwhile submerged. In April and May Alvinmade its first trip to the East Pacific Rise at 21 deg North. These geology dives revealed hot water vents or “black smokers” spewing forth super-heated water at 350 degC (650 degF). Many of the same animals found at the Galapagos vents were found at this location off Mexico. Further dives near San Diego, Tamayo Fracture Zone, East Pacific Rise, and Galapagos were made from June through December. Alvincompleted its 1,000th dive at the Galapagos Rift in January. Alvinreturned to the Mid-Atlantic Ridge and Kane and Oceanographer Fracture Zones during June and July for geology studies as well as additional dives along the East Coast, the Bahamas, and St. Croix. The BBC filmed a television special. Extensive work continued in the St. Croix area, after whichAlvinreturned to Galapagos and the East Pacific Rise following dives in the Panama Basin. The schedule included dives at East Pacific Rise and Guaymas Basin. CBS News Anchor Walter Cronkite made Dive 1211 to the hot vents. Dives at the Panama Basin were followed by a long transit to the Mid-Atlantic Ridge. Alvinreturned to Woods Hole in August and completed local studies for biology, geology, and ocean engineering followed by dives in the Florida Straits and the Providence Channel. 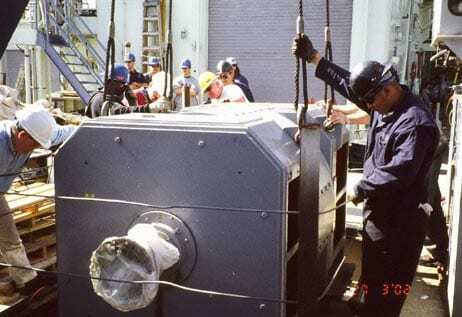 A major Alvinoverhaul in Woods Hole included the addition of a T-fitting on the sub’s frame to allow for a single-point overhead lift system, replacing the elevator method. At the same time, R/V Atlantis IIwas prepared for its new role as mother ship and tender for Alvin. These extensive modifications were conducted during AII’s regular mid-life refit. A large A-frame was added to the stern for Alvinlaunch and recovery. Alvinand Atlantis IIdeparted Woods Hole in January for Charleston, SC. Final preparations and harbor tests, including the first actual Alvinlaunch and recovery with the A-frame, were followed by a geology cruise to the Blake Plateau. Several rough water recoveries were made at sea, proving the A-frame system could work under less than ideal conditions. Alvintransited to the Pacific for further dives in the Panama Basin and on the East Pacific Rise. In mid-April the towed camera sled ANGUS discovered a new vent field to the south of the dive area, and Alvinvisited it. Much of Alvin’s work during 1985 focused on the vent communities at Guaymas Basin in the Gulf of California, the East Pacific Rise off Mexico, and near the Galapagos Islands. Successful tests were made of new deep ocean sampling and photographic equipment designed for control from within Alvin. In November, Alvinreturned to Woods Hole to begin a five-month overhaul. The first part of the year was spent completing the major overhaul, with improvements made to the submersible’s propulsion, electrical, and instrumentation systems. The large stern and small side lift propellers were replaced by six small electric thrusters to increase speed and maneuverability. Brushless DC motors designed specifically for Alvinreplaced the hydraulic propulsion system, providing increased reliability, efficiency, and performance. Other improvements were made to Alvinduring the overhaul. Safety release devices, payload capability, personnel sphere internal arrangement and the data logging/display system were upgraded. In May, certification dives were held in Bermuda before Alvinreturned to service. Dives on the Mid-Atlantic Ridge at newly-found hot water vents discovered new species of shrimp and a six-sided animal thought to be extinct. In July, considerable media attention focused on dives to the wreck of RMS Titanic. Alvinmade 12 dives to test a prototype robotic vehicle called Jason Jr. and to photographically document the wreck. After several other cruises in the North Atlantic, Alvindeparted Woods Hole in late September to begin a two-year voyage into the Pacific. Year-end dives were made in the eastern Pacific with a holiday port call in San Diego. Dives in the western Pacific near the Mariana Islands kept Alvinbusy for much of the spring and summer, with new hydrothermal vent communities discovered in that area. A port call in Tokyo in early August brought thousands of visitors, including Japan’s Crown Prince Akihito. Transit to Oregon followed as Alvinbegan a series of dives on the Juan de Fuca Ridge off Washington and Oregon to continue ocean floor studies. Year-end dives in the Santa Catalina Basin were followed in November by drydocking of Atlantis IIin San Diego for routine hull repair and maintenance. Biology dives in the Santa Catalina Basin off San Diego in January preceded extensive biological and chemical studies in the Guaymas Basin. A trip to the East Pacific Rise in March saw geological work on ridge processes and was the site of AlvinDive 2000 on March 22nd. Atlantis IIand Alvinheaded farther south in April to the Galapagos area for more research at the vent sites first explored in the mid-1970’s. A series of dives on the Oregon Continental Margin and Juan de Fuca Ridge began in early June to measure geological and geochemical processes as well as heat flow rates at "hot smoker" locations. In October, a benthic drifting algae and geologic study was conducted in Monterey Canyon, followed by more dives in Catalina Basin. In late November, the ship and submersible visited a biological study site at an underwater volcano off Acapulco, then transited the Panama Canal en route to Woods Hole. The first seven months of 1989 saw Alvinundergo its triennial overhaul, with replacement of the sub’s through-hull electrical penetrators the major task. 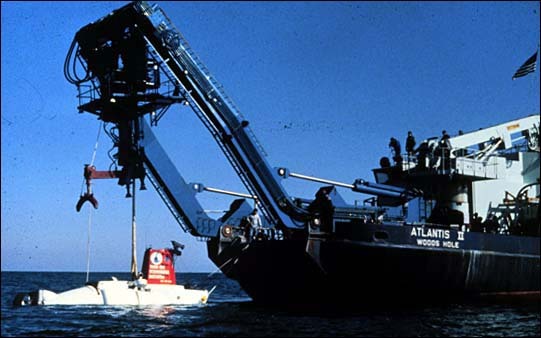 Atlantis II, meanwhile, carried scientists to the Mid-Atlantic Ridge for the first nonsubmersible studies since the 1983 conversion. A series of test and certification dives near Bermuda started the diving research season in mid-August, followed by work on the continental rise off New Jersey and biological community studies at the New York Bight sludge dumpsite.Alvinstarted December with more geological sampling on the rise south of New England, and following the holidays departed on Leg 1 of Voyage 125, scheduled to keep the ship operating away from Woods Hole for almost three years. The first score of dives this year was spent exploring geochemical aspects of active hydrothermal vents on the Mid-Atlantic Ridge south of the Azores. After transiting to Jacksonville, Atlantis IIentered the shipyard for a month of maintenance concurrent with minor Alvinupkeep. Transiting north in July, Alvinbegan work on the Juan de Fuca Ridge in support of geophysical crustal studies, followed by interdisciplinary work for NOAA on the southern end of the ridge in August. The ship worked its way back south during September, with dives in Monterey Canyon en route to San Diego. Twin dive series on Fieberling Seamount west of California occupied the majority of the fall, while short cruises to the Santa Catalina Basin in early and late November allowed studies of benthic biology and Alvin’s Navy inspection. The diving season opened in February in the Santa Catalina Basin where studies of whale bone biological communities were conducted. Following a transit to the Gulf of California, diving continued in the Guaymas Basin in support of hydrothermal vent system experiments. From there the ship and submersible returned to the East Pacific Rise for two studies of hydrothermal, volcanological and geochemical processes near ODP drill sites and the Siqueiros Transform. After transit back to San Diego in late May, Alvinentered a maintenance period in which the main batteries were replaced and a Navy certification audit was successfully completed. One week prior to the end of the maintenance period the AlvinGroup was requested to assist the Navy in the recovery of its CURV III towed ROV system, lost off the coast of southern California.Alvinwas quickly reassembled and made four search dives before finally recovering the vehicle on July 1st. Our first cruise in early February gave the Alvinoperations team a rare chance to conduct a series of engineering test dives off San Diego. Experts in the photographic, underwater video and acoustic fields were invited to participate in five shallow dives to recommend improvements in Alvin’s capabilities. Experiments included calibration of the still camera fields of view, evaluation of a new generation of video lighting and qualitative analysis of optimum light configurations, exposure tests for various cameras, application testing of a low-cost fathometer, and vehicle attitude/performance analysis. Extensive testing of the sub’s hydraulic system resulted in corrective measures designed to bring performance up to advertised capability. Constructive external input from industry participants has already fostered interest in both real-time, 3-D graphical display ofAlvin’s position in a navigated volume and the potential for "video inertial navigation" from computer processing of video images. Scientific dives began on the East Pacific Rise in late February, where a multi-institutional team of investigators studied hydrothermal and geochemical processes in support of ODP work. The Rise area at 9 deg N had been found to be active during a late-1991 dive series, so experiments during this cruise provided an unusual temporal look at vent processes. Late in March, the Rise at 21 deg N was the site of geochemical sampling of hydrothermal fields, and in April scientists returned to the Rise at 10 deg N to complete experiments initiated with the French submersibleNautilein 1991. Following a transit through the Panama Canal in early May, Alvinand Atlantis IImade a port call in Galveston before beginning studies of chemosynthetic ecosystems at two sites in the Gulf of Mexico. Two dives were made for specimen collection at the West Florida Escarpment cold seeps, and the final dive of Voyage 125 allowed a video transect of megafaunal habitats on the Continental Rise near Block Canyon. The ship and sub returned to Woods Hole on June 10th after 575 days at sea, 367 dives and 894 days away from home port. After a six-week layup the vessels departed WHOI in early August for studies of biological communities at Deepwater Dumpsite 106 off New York. Upon return to Woods Hole mid-month, Alvinbegan a major overhaul period. Two milestones were reached this year, the first in early February. An arduous series of calculations and tests, performed in conjunction with the NAVSEA branch of the Navy, had proved that Alvin’s pressure hull was capable of withstanding even greater pressures than it had yet been subjected to, while still maintaining the substantial safety factor required for human occupancy. An increase in our depth rating by as little as 500 meters (to 4,500 meters or 14,764 feet) would allow investigators to explore an additional 20% of the ocean bottom! Replacement of the steel motor controller housings would be required due to their insufficient thickness, but once new titanium units had been installed the path was cleared to recertification. On February 5 three Alvinpilots made the historic dive to our new depth limit, paving the way for additional deep dives during the Costa Rica voyage. The second date of note was June 5, 1994: Alvin’s 30th birthday. Most frequently asked question during the ceremonies held at Woods Hole and attended by numerous military and governmental dignitaries: does any part of the original Alvinremain in use today? The answer: no, all parts of the sub have been replaced at one point or another during her illustrious career as a deep ocean research platform, including the frame and pressure hull. As with many government-funded operations in the US of late, the Alvinprogram was required to yield to budget pressures and curtail work by 60 days this year. A 30-day stand down in May was followed by a return to the Juan de Fuca area, where scientists continued time series measurements at hydrothermal vent field sites. A crew from a nature films production company recorded dives on the northern Ridge for inclusion in a television special on underwater research. In late summer-early fall a team from Scripps Institute of Oceanography studied benthic boundary layer biological communities at a site off California, followed by three final cruises to the Guaymas Basin and East Pacific Rise. A new, submersible-mounted rock drill was successfully tested, retrieving samples of volcanic material previously unreachable. 1994 ended with a transit to and the final half of the mandated stand down in Woods Hole. The first voyage of the year took ship and submersible back to the TAG hydrothermal site on the Mid-Atlantic Ridge to complete dives lost two years earlier because of motor controller problems. The next leg visited an ODP well site to collect data from emplaced instruments, followed by a transit through the canal and on to the bottom station at 9 deg N on the EPR, where the progress and growth of biological communities were cataloged. Working their way up the Latin American coast, investigators stopped off California for more biology studies, then proceeded on to the Juan de Fuca for a very full season (81 dives) of multi-disciplinary work. Most programs were continuations of previous field research, but new cameras, sonar systems and other sensors recently added to the sub allowed new looks at vent features and fauna. Laser range finders mounted on the sponson now permit scientists to measure the size of objects in the still and video camera fields of view, and vastly improved lighting facilitates close-up observation.Alvin’s two hydraulic manipulators can reach and retrieve artifacts on the bottom, and also activate a variety of water and sediment samplers developed for deep sea use. Alvinrecorded Dive 3000 on September 20. A live underwater telephone/satellite link allowed shoreside dignitaries to congratulate the pilot and observers during the dive. Atlantis IIreturned to Woods Hole for the last time on July 3. Alvinwas lifted off on the 9th and transferred to the dockside hangar to begin overhaul. The ship was stripped of all submersible support gear except the launch/recovery A-frame, which would be transferred to our new vessel Atlantisin Mississippi in late fall. Over 500 people gathered on the pier in late July to bid farewell to the AII, with many fond memories of past cruises shared. In her 13 years as submersible tender, the vessel sailed all of the world’s temperate oceans and allowed Alvinto reach locations our former tender Lulucould never have visited. AII, renamedAntares, will be continuing research under a new owner in the chilly waters off the Pacific northwest. Alvincompleted the triennial major overhaul at the end of March. No major upgrades occurred during this maintenance period, so a majority of the effort was devoted to dismantling, testing and reassembly of all mechanical, electrical and electronic systems. Small stress cracks in the titanium frame and syntactic foam flotation blocks were repaired, and numerous cables and connectors were replaced. 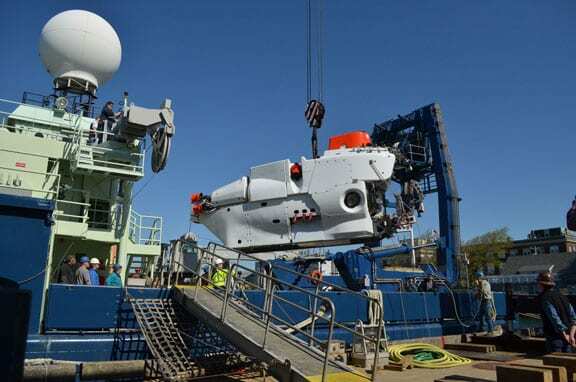 Our new deep submergence support vessel Atlantisarrived at WHOI April 11 following two weeks of builder’s trials on the way north from the shipyard in Mississippi. A large crowd of employees and dignitaries assembled on the dock to welcome the latest addition to our research fleet, the first new vessel WHOI has received since Oceanusin 1975. Fitting out and loading with Alvinand ship stores took over a month, with many modifications needed to stow all the gear. Ship and submersible left WHOI on June 2 for Bermuda to begin the Alvinrecertification process, a series of post-overhaul test and engineering dives culminating in dives to 4,500 meters. 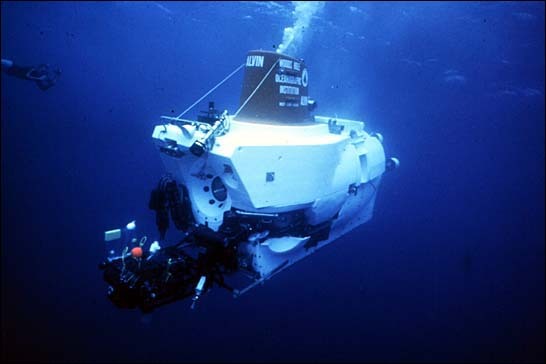 The first science dives of 1997 took place during the transit from Bermuda to the Azores and a subsequent 4-week voyage, where a science party from Great Britain’s British Ridge Project and a film crew from the BBC studied Mid-Atlantic Ridge (MAR) hydrothermal vent vent colonies and biological interactions. During this dive series Alvinand the French submersibleNautilemet and filmed each other on the ocean bottom during two dives, an historic first for these subs. In early August Atlantistransited through the Panama Canal to San Diego to begin work in the eastern Pacific. Three dives near San Diego for study of age-dependent bioturbation of deep sea sediments led this portion of the schedule, conducted by researchers from the University of Hawaii. At the end of the month, Jason(WHOI’s primary remotely operated vehicle) was loaded on board the ship in preparation for our first test of Deep Submergence Group joint ROV/sub operations. This is the work Atlantiswas designed for, allowing investigators to use the complete suite of underwater tools from the same platform anywhere in the world. A test lowering of Jason was conducted during the transit north to Astoria, Oregon, followed by two lengthy cruises to the Juan de Fuca hydrothermal region for geological experiments. Jason and Alvinwere used during alternate periods to provide large- and fine-scale sampling capabilities, respectively, and performed flawlessly during repeated dives to the ridge vents despite deteriorating weather conditions. Alvinbegan the 1998 operating season at the end of March following a shipyard/NAVSEA post-shakedown interval for Atlantis. The first two dives allowed us to perform some engineering tests off the coast of San Diego. Science dives commenced in early April with a six-dive set for investigators from Skidaway and Florida State studying cage performance relative to benthic biology. A short transit to the Guaymas Basin area followed mid-month to allow an ONR program to conduct a 7-dive interactive field program utilizing Atlantisand the ROV Jason. WHOI investigators next got a chance for further microbiological work in the Basin at 27N and 21N before heading into Manzanillo, Mexico in early May. After making the transit south to the San Diego area in early August, Alvinconcluded the cage performance studies in the Santa Barbara Channel begun in April. A short maintenance period preceeded an extended cruise to the southern Pacific, which began in September with a transit to and work near Easter Island on the East Pacific Rise at 18S. During early fall investigators recovered and redeployed long-term monitoring instruments left during a 1997 Shinkai 6500/Yokosuka cruise and examined gas and fluid chemistry of hydrothermal systems on a superfast Rise spreading center. These two legs involved a total of 35 dives and required 76 days of ship time before returning to Manzanillo, Mexico in mid-November. Another time-series cruise to the Northern EPR was up next, where investigators from USC and the University of Delaware studied dispersal potential of hydrothermal vent animals. The final leg of the 1998 season again took the ship south toward Easter Island for volcanological research on the Rise at 18S, with the leg scheduled to end at Easter Island in mid-January 1999. 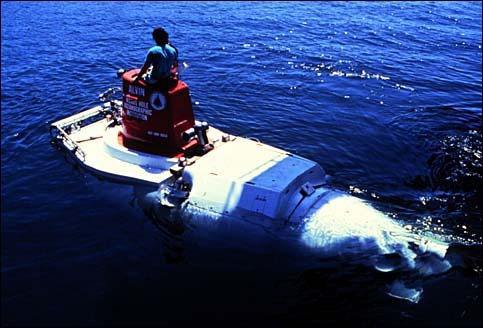 The manned component of the Deep Submergence Facility, Alvinaboard Atlantis, began the 1999 operating season with the continuation of a cruise for Rutgers and NOAA investigators conducting volcanological research on the Southern East Pacific Rise at 18° S, with the leg ending at Easter Island in mid-January. From there scientists from Hawaii and William & Mary continued volcanological experiments in the mid-ocean ridge area south of the equator, focusing on geology and biological communities at fast spreading centers. The DSL-120sonar vehicle, ABE AUV and Alvinwere all employed for this work before the vessel headed north to port in Manzanillo, Mexico. The third leg of the year took a team of Duke researchers to the Hess Deep in the equatorial Pacific to study the geology of oceanic crust, where the ArgoROV was used to provide broad-scale imaging prior to inspection by the submersible. Starting in mid-April from Manzanillo, the final two cruises of early-season East Pacific Rise work consisted of biological experiments at the northern segment of the ridge, first for WHOI/Harvard scientists and later for those from Delaware and Rutgers. These programs were continuations of temporal observations designed to give investigators insight into long-term fluctuations in species populations and dynamics. Following this work, the vessel docked in San Diego for a two-week maintenance period in early June. Taking advantage of the summer weather window, Alvinnext moved north to the Juan de Fuca Ridge off the coast of Oregon and Washington. First up were scientists from Oregon State and Lehigh, who deployed benthic sampling devices such as corers and flowmeters on the Cascadia accretionary prism to characterize conditions at active seafloor vents. Throughout much of July and August we completed another first for Alvin: work in the Gulf of Alaska at 51-57° N, where investigators based at the West Coast and Polar Regions Undersea Research Center coordinated study of species diversity, flux measurements, hydrogeologic, volcanic and tectonic processes on various seamounts. Next the vessel headed back to the Juan de Fuca area for data recovery from six long-term instrumented ODP borehole seals, with additional dives for in-situ measurement of dissolved hydrogen and sulfates in hydrothermal fluids. The final leg in this region in late September carried Pennsylvania and Harvard researchers to the Endeavour Ridge for examination of biological interactions in Vestimentiferan aggregations, followed by a transit south to San Diego at the beginning of October. The next cruise, in the Santa Catalina Basin just off San Diego, took Hawaii scientists back to a whale skeleton study site to continue observation of fauna affinities and behavior. A second two-week maintenance period will followed in San Diego. Two final legs to the East Pacific Rise rounded out the year; both focussing on temporal study of biological communities in the 9-10° N region. Atlantisended the year in San Diego December 28. The 2000 Alvinoperating year began in San Diego with a transit to the Guaymas Basin area in the Gulf of California. The first science cruise allowed Delaware and Penn State scientists to study pyrite deposits, a crucial stratum for microbial life in extreme hydrothermal environments. A return visit to the East Pacific Rise 9N site followed, where investigators conducted near-bottom geophysical traverses across the ridge axis using a gravimeter. The sub and support ship then returned to San Diego for a six-week maintenance period in the schedule. In early June Atlantissteamed north to the Juan de Fuca region to conduct four science cruises during the summer weather window. Univ. of Washington investigators began with multidisciplinary vent studies at previously established hydrothermal sites, followed by attempts to characterize distribution of phototrophic organisms by scientists from WHOI, the Univ. of Alaska and William & Mary. Miami and Scripps researchers then conducted in-situexperiments at an ODP borehole to study the formation of authigenic carbonates and gas hydrates. The last voyage in the region allowed UW scientists to study the effects of tidal fluctuations on fluid sampling. In late September Atlantisbegan the long transit back to Woods Hole, stopping in the Gulf of Mexico to investigate stability and change in chemosynthetic communities for scientists from Texas A&M. From there the ship and sub proceeded to the Mid-Atlantic Ridge via Bermuda, where the last leg of the operating season gave Scripps investigators an opportunity to perform structural mapping of the eastern Atlantic ridge-transform intersection. The ship returned to WHOI in mid-December, whenAlvinbegan a six-month overhaul. 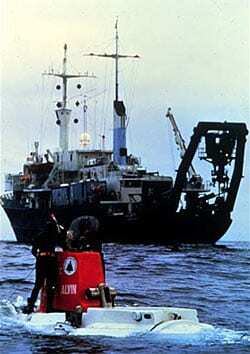 In year 2001, the WHOI Deep Submergence Group began a triennialAlvinoverhaul. Among the items upgraded this time were thruster motor controllers, the in-hull computer system, data logger and camera systems. The external 35mm film camera system was retired in favor of video frame grabbing capability and digital photography. Alvinrecertification dives began in mid-June, and by the end of that month the sub was ready once again to undertake science work. An eighteen-dive program for NSF on the Mid-Atlantic Ridge was the first program scheduled, with the focus on biology and geology of hydrothermal vent sites. That cruise ended in Ponta Delgada, Azores in late July. Another NSF program was next up, which saw an IMAX camera used to film the underwater ridge habitat for later inclusion in a feature film. Several of those dives had only two occupants in the submersible since the large-format camera took up so much room in the peersonnel sphere! The ship with Alvinthen transited to Bermuda for some public relations dives, followed by biological studies in the canyons south of New England. It was during one of these cruises that the terrorist events in New York occurred, forcing our deep submergence assets to alter dive plans numerous times in response to drastically increased Naval activity in the area. 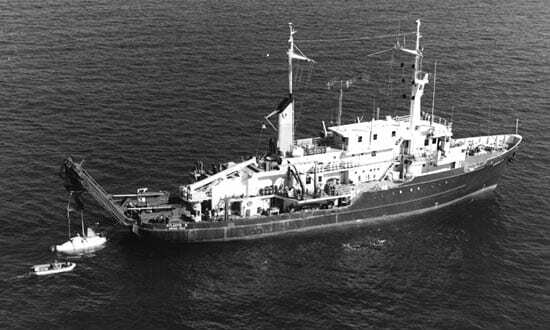 Alvincontinued diving, and the ship sailed south to the Blake Outer Ridge for several final dives in the Atlantic before transiting the Panama Canal and returning to the East Pacific Rise to resume time series programs. Four cruises were scheduled for the East Pacific Rise area in the fall of 2001and early 2002. The focus of these cruises was the extreme environment of hydrothermal vents and the effects on the biology found there, as well as to study the Central Anomaly Magnetic High, CAMH, along the fast-spreading East Pacific Rise. The final cruise for 2001 departed Manzanillo, Mexico in early December and facilitated investigation by UCSB scientists of the evolutionary instability at two different vent sites. We began the year by finishing a cruise which originated in 2001 at the East Pacific Rise, and then left immediately for an NSF-funded cruise departing Manzanillo, Mexico during the first week of January. During this voyageAlvindove 25 times for UNH researchers to conduct geochemistry/biology work at the Biotransect site. This cruise was followed by a five-week maintenance period in San Diego which included an Atlantissubmersible handling system Navy certification inspection. The first cruise following maintenance mid-March was to take the vessel a short distance from San Diego for IMAX filming of the sub launch sequence for inclusion in an upcoming feature production on the deep sea. Unfortunately, during the first dive the ship's two stern propulsion motors developed electrical problems due to carbon buildup, requiring them to be shut down before further damage resulted. Alvinoperations were suspended and the ship was towed back into San Diego for five weeks of extensive repairs, including motor replacement and testing. In late April the vessel was once again readied for sea, new motors tested and the IMAX filming completed. Somewhat behind schedule, the vessel headed south to begin work on the East Pacific Rise. The first set of dives at the EPR were to conduct geology Alvindives that could not be made as originally scheduled in late 2001 due to viewport problems. This cruise terminated in the Galapagos Islands, where a second science party embarked for nine dives at the Galapagos Rift to commemorate the 25th anniversary of the discovery of hydrothermal vents at that site. The area looked quite different from our last visit, with many of the biological communities wiped out by fresh lava flows and recent tectonic activity. New areas of activity were discovered, however, and new sites mapped and named. In early June Atlantis transited north along the west coast of the U.S. to Astoria, Oregon, where NOAA scientists embarked for a leg to explore the biology and geology of selected Gulf of Alaska seamounts. Afterward the vessel returned to Astoria where the brand new Jason IIROV was loaded aboard for a week of sea trials, which proceeded without a hitch. Alvininstrumentation and auto-pilot control software improvements were also tested during this period. Two Alvincruises in the Juan de Fuca region were conducted in July/August, followed by a September cruise utilizing Jason II, that vehicle's first science use, and two other non-Alvinmooring trips. Heading south once again in mid-October, the ship picked up a science party in San Diego and started the last three cruises of the year, involving NSF-sponsored Alvindives and biological studies on or near the East Pacific Rise. The year ended with Atlantisdropping the science investigators in Puntarenas, Cost Rica before transiting the Panama Canal and arriving in Miami New Year's Day 2003. Atlantisbegan 2003 in the shipyard undergoing maintenance and a Navy in-service inspection. The first cruise after the yard period supported engineering trials. Two dives were scheduled and completed under the watchful eye of Barrie Walden, Group Manager. Alvinscientific diving operations began in early April with a 30-day voyage to the Lost City hydrothermal field south of the Azores. The purpose of this leg was to sample vents for fluid, microbes and chimney material, as well as characterize the surrounding geology and tectonic setting. Eighteen dives were scheduled and 21 dives were completed for the University of Washington. 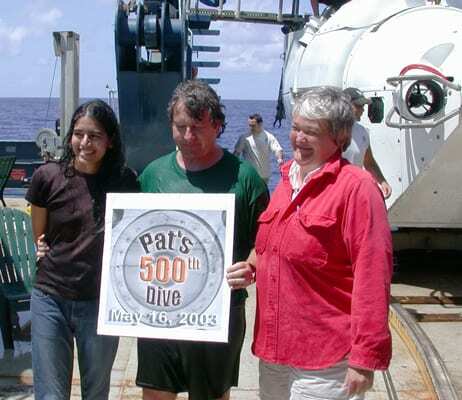 AlvinExpedition Leader Pat Hickey completed his 500th dive during this cruise. Moving back to the New England Seamount area in late May,Alvincollected deep-sea corals and bathymetry data for CalTech researchers. Fifteen dives were scheduled, but only 11 dives were completed due to extended bad weather. Of those completed, several were made at a secondary seamount because of continued bad weather at the primary seamount area. 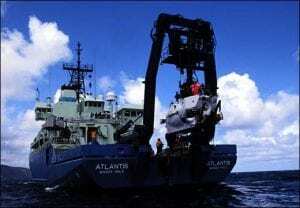 In early June the ship and submersible returned to the TAG site on the Mid-Atlantic Ridge for deployment of WHOI seismic and thermal monitoring equipment on and around a hydrothermal mound. Six dives were originally scheduled but seven dives were completed during this voyage. In July and August, two cruises were conducted for NOAA Ocean Exploration dives off the southeastern US coast. Thirteen dives were scheduled for the two legs and all were completed. After an extended ship maintenance period in Woods Hole during August and September, Atlantistransited to the Gulf of Mexico where another NOAA party explored the ecology of cold seeps. In late October Atlantistransited from Galveston through the Panama Canal and boarded the next science party. From Panama, a Field Museum of Chicago scientist and her party surveyed vent fauna along the East Pacific Rise at 9 degrees North. The final cruise for the year was to the East pacific Rise at 9 North for researchers from the University of Delaware and Harvard to conduct an analysis of microbial symbiosis and deploy an in-situ electrochemical analyzer. The ship ended the year with a transit from Manzanillo, Mexico to San Diego. A special year for our submersible, with two notable milestones reached. A scheduled United States Coast Guard inspection and a maintenance period in San Diego, California led off this year. We had one engineering dive before science operations began 28 January, which sent the ship south to the East Pacific Rise, (EPR) to continue on-going research at Latitude 9 North & Longitude 104 West. This RIDGE 2000 expedition characterized geological features of the Central Anomaly Magnetic High, (CAMH) and allowed further development, testing, & calibration of an in-situ chemical sensor. An early March cruise for the Ocean Drilling Program (ODP) to the Costa Rican subduction zone enabled researchers to collect samples from long term bore-hole observatory sites. In March and April Atlantisreturned to the East Pacific Rise Integrated Study Site at 9 North. This series of dives focussed on hydrothermal fluid chemistry, biological community structure and the seismic activity of this ocean region. Alvinalso completedDive 4,000during this series. In May the ship transited north to the Pacific Northwest's Juan de Fuca Ridge area for several Alvincruises and three general oceanographic research cruises. The latter included a voyage to deploy a prototype deep-water acoustically linked seafloor observatory. 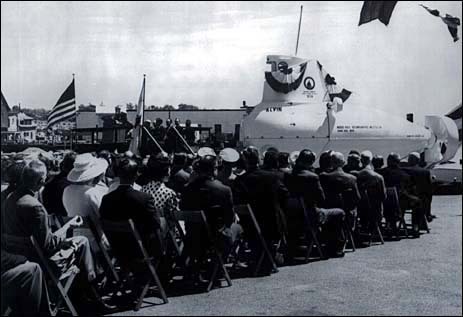 In June, Alvin passed its 40th anniversarysince commissioning in 1964. 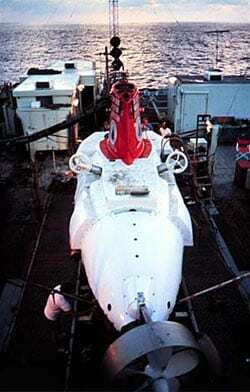 Researchers off Oregon tested an in-situincubator designed to explore the limits of life at submarine hydrothermal systems, and in July another RIDGE 2000 Endeavor Integrated Study Site cruise used the autonomous underwater vehicle ABEto measure the fluxes of heat and materials that tie geological forcing to biological responses. Atlantissupported a joint NSF/NOAA ECOHAB cruise in September, and then transited south to San Diego for a second scheduled maintenance period. The ship finished the operating year with two Biocomplexity cruises featuringAlvindives on the East Pacific Rise. Alvinbegan 2005 with a short maintenance period in San Diego. Our operating season started 14 January, with the ship and submersible heading south of the equator to the southern portion of the East Pacific Rise for both ROV andAlvinoperations. The first program, from Easter Island to Tahiti, enabled researchers to locate and observe geological outcrops at the Pito Deep. In March Atlantis/Alvincontinued work in the southern Pacific for researchers from MBARI and William & Mary, who studied gene flow and species diversity at hydrothermal vent communities. Data and samples collected on this cruise will benefit undergraduate, graduate, and post-doc students. In April Atlantistransited north from Easter Island, crossing the equator once again to the EPR at 9° N to continue the NSF-funded RIDGE 2000 Program. This collaborative research program included biological community structure experiments and seismic monitoring, and featured educational and public outreach components. The submersible next embarked on a NOAA Ocean Exploration cruise to the Galapagos area in mid-May, transiting east-northeast to study biological succession at hydrothermal vents along the Galapagos Rift near 86° W. Atlantisheaded to the Costa Rica margin in early June for testing of instruments designed by Scripps investigators that measure elemental fluid flux from ocean floor boreholes. Later that month the ship and sub transited north to the Pacific Northwest's Juan de Fuca Ridge for continuation of 2004 non-Alvinresearch. These cruises included a second joint-funded NSF/NOAA ECOHAB cruise and a mooring recovery cruise to retrieve a prototype deep-water acoustically-linked seafloor observatory. A two-week maintenance period in August was followed by two Alvincruises on the Juan de Fuca Ridge. These projects included the testing of sensors for in-situ analysis of ecosystems, chemistry of hydrothermal vents and retrieval of data from Integrated Ocean Drilling Program 2004 deployments. An ONR-fundedAlvinengineering dive was included in the earlier of these cruises. In late September Atlantisbegan transit back to Woods Hole, only the third time the ship had been in her home port since delivery in 1997! The final science leg of 2005 was for NOAA/NURP deep water coral investigations on the New England seamounts. Upon completion of that work, Alvinbegan a six-month scheduled major overhaul. Alvinbegan 2006 with the last portion of the major overhaul started in early November of 2005. Work was completed in mid-April, and the last two weeks of the month were spent conducting test and certification dives in deep water near Bermuda.Upon completion of the test period, Alvinand Atlantisreturned to their primary research support mission. Atlantistransited to the Gulf of Mexico for Alvindives for a joint NOAA Ocean Exploration, NOAA Undersea Research Project, and Mineral Management Services program. In June the ship transited through the Panama Canal to the Pacific where Alvinwas used to recover instruments that measure fluid flux through sediments on the Costa Rican margin. In July Alvinbegan a series of cruises along the California, Oregon, and Washington coasts. The first cruise was one of two that utilized Alvinto study metazoan life at extreme sulfide concentrations. The next program moved to abyssal depths to deploy an autonomous bottom-transecting instrument for making long time-series measurements. In mid-August Atlantistransited to the Juan de Fuca Ridge for an Alvindive program to determine the limits to life in submarine hydrothermal systems and a program to develop “smart” sensors for in situmonitoring of hydrothermal fluids. A second Juan de Fuca Alvindive program was conducted for remedial cementing at two borehole observatories. Atlantisthen transited south for a second Alvinprogram to study metazoan life and a program characterizing the micro-organisms at methane seeps. After a short maintenance period in San Diego in mid-October, Alvinbegan a series of cruises on the East Pacific Rise (EPR) with the first of two cruises that studied oceanographic and topographic influences on dispersal of hydrothermal vent species. In November Alvincontinued a multidisciplinary time series study of temporal variations in hydrothermal fluid chemistry at the RIDGE2000 Integrated Studies Site at 9°N on the EPR. The year ended at the EPR with the second Alvinprogram to study dispersal of hydrothermal vent communities. Atlantisand Alvinbegan operating year 2007 at sea studying the dispersal of hydrothermal vent communities at the East Pacific Rise (EPR). The educational and outreach programs Dive and Discover and Women Exploring the Ocean were featured on this cruise. Later in January Alvincontinued diving operations at the EPR with a collaborative research project examining biological community structure at deep-sea hydrothermal vents. This cruise included formal and informal education and outreach activities in collaboration with NSF COSEE Centers and the Ridge 2000 education and outreach program. Atlantissaw two non-Alvinvoyages in February and March and then began a 62-day shipyard period. In late June, Alvinconducted three engineering dives off San Diego before continuing with science operations. The engineering dives were required both to ensure system operability due to the extended period (five months) of non-operability and to test new equipment and procedures such as an Imagenex sonar calibration routine. Alvin was utilized during the month of July to study the microbial geochemistry of natural marine gas seeps in the Catalina Channel. After another two non-Alvinlegs, Atlantistransited to the Juan de Fuca (JdF) area in August, where Alvinoperations continued in the main Endeavor Field looking at the thermal biology of hydrothermal vent paralvinellidworms and testing an underwater optical communication system. During September Atlantisand Alvinremained at JdF servicing borehole observatories and continuing the study of hydrothermal vent flow and turbulence. Atlantisthen transited south for a short maintenance period in San Diego. In mid-October Atlantissteamed south to the Guaymas Basin and EPR vent sites whereAlvinwas used to examine protistan abundance, diversity and activity and to study the physiology and molecular ecology of thermophilic nitrate-reducing microorganisms. Outreach programs such as Extreme 2000 and Student Experiments at Sea were supported during this cruise. Throughout November Alvincontinued operations at the EPR studying oceanographic and topographic influences on dispersal of hydrothermal vent species. In December Alvindove on the EPR looking at temporal variations in hydrothermal fluid chemistry. Alvincontinued working at the EPR into early 2008, with a microbiological and biogeochemistry study of filamentous-sulfur producing bacteria scheduled. This final cruise of the year installed in-situchemical sensors for monitoring the chemistry of hydrothermal vent fluids and supported the Dive and Discover education and outreach program. Alvinstarted operating year 2008, our 44th, at sea with researchers studying microbiology, biogeochemistry and testing chemical sensors of hydrothermal vent communities at the East Pacific Rise (EPR). The cruise ended in San Diego where Alvinwas offloaded at the Scripps pier in preparation for a mandatory dry docking of Atlantis. Routine maintenance was be performed on Alvinwhile it was ashore, followed by an engineering dive during the transit to Mazatlan, Mexico, in late April. A non-Alvincruise in the Gulf of California occupied the month of May. Alvinwent back to work at the EPR in early June for a program using in situvoltametric analyzers to study hydrothermal vents, and subsequently a program to establish a long-term geodetic network at the Ridge 2000 Integrated Studies Site. In late June Atlantistransited north from San Diego to Astoria, Oregon to begin work in the Juan de Fuca area. From Astoria, Atlantisand Alvinmade three cruises to the ridge system, with multiple investigators on each cruise. The voyages combined a variety of programs, including the study of thermal biology of hydrothermal vent parAlvinellidworms; vent flow and turbulence monitoring; a continuing program at the ODP borehole observatories; testing optical communication sensors; modeling hyperthermophile growth and continuation of the NOAA-VENTS Research Program. The ship and sub completed work at Juan de Fuca in early September, then made engineering dives during the transit from Astoria back to San Diego. Atlantis was out of service for a two-week period in San Diego in early October while the vessel underwent a Navy INSURV inspection. In the middle of the month Atlantistransited to Guaymas Basin for Alvindives to study microbial carbon and sulfur cycling in hydrothermally altered sediments. The vessels continued work in Guaymas Basin and at the EPR for the remaining three cruises of the year. These hydrothermal vent expeditions included the study of protistan abundance, diversity and activity; metagenomic exploration of virus-host interactions in deep-sea hydrothermal vent environments; the abundance, diversity, and activity of microorganisms and microbiology and biogeochemistry of autotrophic microbes. Alvin was idle at end the year but Atlantis continued work with a geology leg to the Galapgos Triple Junction. Alvinbegan its 2009 operational year in February off Costa Rica supporting a cruise to retrieve instruments and stored data at an ODP borehole instrumented observatory. 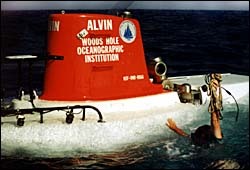 This first dive series also included an Alvinengineering dive. The submersible then continued work in that area into March on a second cruise with scientists from SIO in support of studies of structure, function and evolution of authigenic, methane-derived carbonate ecosystems. Following these programs Atlantisreturned to San Diego and entered a maintenance period, while Alvinhad its annual Navy sustaining certification survey. In May Atlantistransited from San Diego to Astoria, OR, conducting a non-Alvinscience program on the Juan de Fuca Ridge en route. Alvinbegan a series of three diving legs on the Juan de Fuca Ridge in late June. The first voyage supported interdisciplinary research modeling hyperthermophile growth in deep-sea hydrothermal sulfide deposits and diffuse fluids, and featured a second Alvinengineering dive. Next scientists from WSU utilized collaborative research to look at the thermal biology of hydrothermal vent paralvinellid worms. The last of these legs pursued large-scale, long-term, multi-directional, cross-hole experiments in the upper oceanic crust using a borehole observatory network. The vessel and vehicle transited south in early September for a program in the Catalina Basin off Santa Barbara, where investigators from UCSB studied microbial geochemistry of natural marine gas seeps. Atlantisentered a second maintenance period for two weeks in early October. Departing San Diego in the middle of the month, Atlantisconducted another non-Alvinprogram, taking the vessel to Guaymas, Mexico. Two Alvinscience programs were conducted in the Guaymas Basin from November to early December. The first saw investigators from UNC studying microbial carbon and sulfur cycling in the hydrothermally altered sediments of Guaymas Basin. On the second cruise scientists from Portland State examined the distribution and diversity of thermoacidophiles from deep-sea vents. Atlantisand Alvinfinished the year with a cruise off the west coast of Mexico where researchers tested models of magma movement along the East Pacific Rise using combined geodetic and numerical experiments. Alvinstarted the 2010 operational year at sea with investigators establishing a long-term geodetic network and testing models of magma movement at the East Pacific Rise. After a brief stop in Costa Rica, the submersible continued work just offshore with scientists from SIO studying the structure, function and evolution of authigenic, methane-derived carbonate ecosystems. Following these programs Atlantistransited south to Iquique, Chile, where investigators from USC boarded to start a non-Alvincruise to document nitrogen fixation in nitrogen-deficient waters of the Eastern Tropical South Pacific. In March the ship transited to the Galapagos to begin a 31-day voyage for University of Hawaii researchers studying the effect of variable magma supply on eruption and magma chamber processes on mid-ocean ridges. AUV Sentrywas used in conjunction with Alvinon this cruise, along with multibeam surveying and dredging. In mid-April the ship transited north to San Diego and entered a brief maintenance period. Alvinhad its annual Navy sustaining certification survey during this period, and Atlantishad a USCG inspection. Another non-Alvin cruise began in mid-May, this time taking scientists off the coast of California to explore air quality and climate change as part of NOAA's CalNex 2010 field program. After a port stop in San Francisco, a series of oneJasonand twoAlvincruises took the ship northward to the Juan de Fuca area. The first voyage studied the microbial ecology of ocean basement aquifers at ODP borehole observatories and large-scale, long-term, multi-directional, cross-hole experiments in the upper oceanic crust with investigators from Hawaii and UC Santa Cruz. The next leg allowed scientists from Washington State, WHOI and the University of Washington to look at thermal biology of hydrothermal vent paralvinellid worms, conduct resistivity probe deployments at the Endeavour Integrated Study Site and test a CORK optical telemetry system. The final leg in this area took Scripps researchers off the coast of Oregon to explore the structure, function and evolution of authigenic, methane-derived, carbonate ecosystems. In mid-August Atlantistransited from San Diego to Woods Hole, arriving at her home port for the first time in more than four years. The next two voyages were non-Alvinon the Nova Scotian continental shelf. The first trip took WHOI scientists for deployment/recovery of bottom-tethered sediment trap moorings, hydrographic sampling of bottom and intermediate-depth nepheloid layers via CTD/Niskin rosette and multicoring of surface sediments. The second leg supported a sustained measurement program sampling the North Atlantic Deep Western Boundary Current and the Gulf Stream. The ship transited to Galveston in early November, where scientists from Georgia embarked to set up a microbial observatory in the Gulf of Mexico examining microbial abundance, diversity, associations and activity at seafloor brine seeps. The final cruise of the year was aneffort to gauge the response of benthic hard bottom communities to oil exposure in the deep Gulf of Mexicofollowing the Deepwater Horizon oil spill earlier in the year. The ship transited back to Woods Hole in early December to offload Alvinin preparation for the major upgrade. 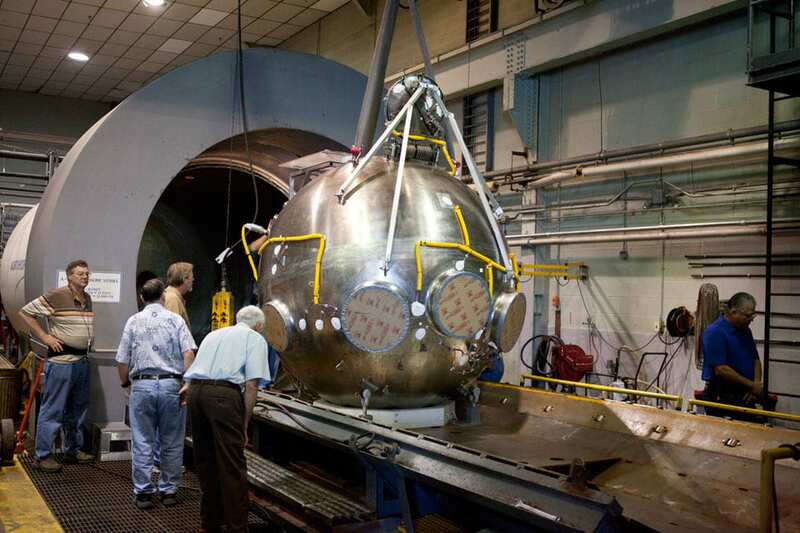 The personnel sphere was forged from titanium ingots in Wisconsin, machined and welded in California, heat treated in Ohio, pressure tested in Maryland and underwent final assembly in Texas before being shipped to Woods Hole. It is an inch thicker than the previous sphere, and has 27 cubic feet more interior voulme. 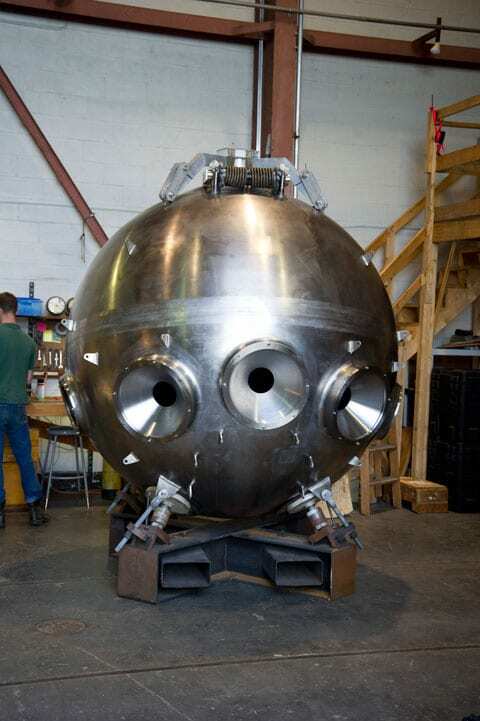 Alvin's titanium frame was modified in New Jersey to accept the new sphere, and new syntactic foam was manufactured and installed to float the increased submersible weight. All thrusters are now releaseable in the event of entanglement, as are the manipulators, batteries and science basket. High definition cameras and LED lights have been added, and fiberoptic cables transmit high quality video signals to recorders within the sphere. 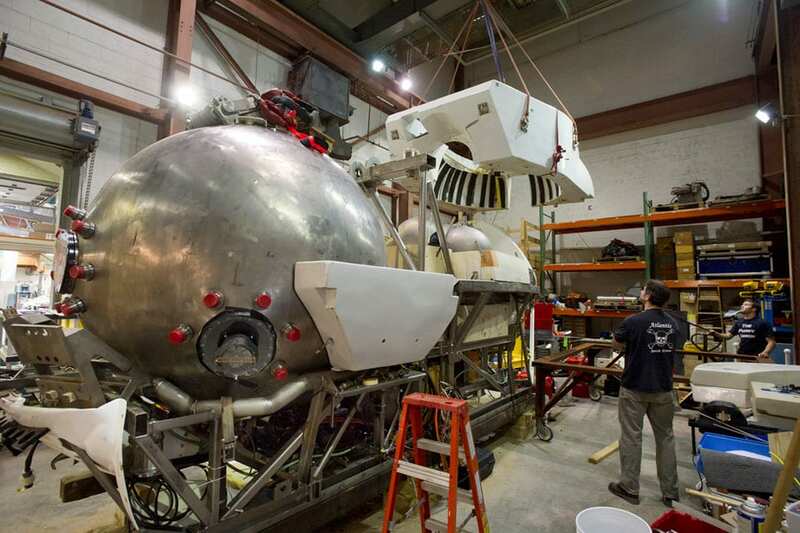 Final assembly of the submersible continued into the early months of 2013. Most of our efforts in late winter and early spring were concentrated on obtaining certification of vehicle subsytems from the Navy's Naval Sea Systems Command (NAVSEA), our certifying authority. Several subsystems, notably life support, received extra scrutiny from NAVSEA engineers due to their critical importance, which delayed approval. As the ship departure date in mid-May approached, we were obligated to postpone in-water testing of the submersible until after a series of non-Alvincruises. The sub was loaded aboard Atlantis, and the vessel sailed for Panama and the west coast. During the summer and early fall months we continued to work with NAVSEA on certification issues. Technicians aboard Atlantiswere able to finish several small projects to get the sub ready for diving. NAVSEA completed its review of submersible designs and approved the systems as safe for use in November. Inclining/stability testing was conducted in San Diego, followed by harbor trials. Alvinnext conducted ocean trials, diving to progressively greater depths, and successfully completed a certification dive with a NAVSEA observer to a depth of 3,729 meters on November 18. Lack of proximal deeper water and additional cruise time precluded completion of a deeper certification dive on that voyage. It is anticipated the sub will be able to make a certification dive to our design depth of 4,500 meters sometime during the 2014 operating season. Following the January Jasoncruise at the East Pacific Rise, Atlantis transited through the Panama Canal to New Orleans, LA, arriving in early February. After a month-long maintenance period, the Alvinoperations team mobilized in mid-March in support of a science verification cruise in the Gulf of Mexico. This voyage engaged a group of interested scientists from across the US HOV-user community to conduct a series of scientific investigations that made increasingly complex demands of the upgraded HOV, in pursuit of real-world scientific objectives, to demonstrate the effectiveness of the new vehicle and its readiness to resume National Deep Submergence Facility operations. 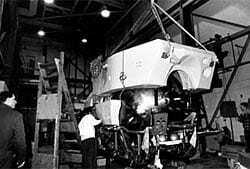 All scientific instrumentation on the submersible was tested and crew training on the upgraded vehicle continued. Departing from Gulfport, MS at the end of March, the first purely science voyage of 2014 took the vessel, submersible, and University of Georgia researchers to the northern Gulf of Mexico to sample brine seeps located at water depths between 800 and 3,200 m along the continental slope. Depth profiles of brine were collected using a novel sampling device, the 'brine trapper'. Several 'brine traps' were collected at each site to obtain samples for microbiological and biogeochemical characterization. Monitoring instrumentation, including insiturotary cameras and thermistor strings were deployed at the sampling sites for recovery one year later. The next cruise departed at the end of April from Gulfport for physiological and genetic response studies of the deep-water coral, Lophelia pertusa, to ongoing ocean acidification in the Gulf of Mexico. Temple University scientists collected samples at five different sites across the northern Gulf of Mexico, and also utilized AUV Sentryfor large-scale surveys. Additional water samples were taken using the CTD rosette to characterize the carbonate chemistry of the water column. This voyage was followed by a month-long trip to the Florida Escarpment seeps, brine pools and Alaminos Canyon for characterization of hydrography, larval abundance and distributions, and population genetics of seeps in the intra-American sea to determine processes and dynamics of connectivity. Duke University researchers mapped seep sites in the Gulf of Mexico with Sentryand sampled benthos for reproductive biology and genetic analysis with the submersible. The ship returned to St. Petersburg, FL in mid-June. After a transit to the west coast, Alvinresumed operations on the Juan de Fuca Ridge in mid- July. A collection of scientists from LDEO, the University of Minnesota and WHOI deployed new instrumentation at Axial volcano to accurately measure the heat and mass flux of hydrothermal vent fluids and tested two seafloor camera systems that measure fluid flow in mid-ocean ridge systems. The second and last Alvinvoyage of the year to the Juan de Fuca eastern flank occurred in August when University of Alaska researchers completed the final phase of borehole monitoring, sampling, and experiments at IODP drilling sites. Scientists also completed a final round of wellhead fluid and microbial sampling, downloaded pressure data from CORKs, recovered the remaining OsmoSampler systems deployed on wellheads, and recovered a wellhead flowmeter. Three non-Alvincruises took the ship to San Francisco, with arrival in mid-October. A NAVSEA submersible and launch/recovery system audit took place during a short port stay, followed by a transit to Manzanillo, Mexico. There scientists from WHOI and the University of Tampa embarked for a cruise to the East Pacific Rise to deploy the VENT-TSSID instrument to measure in situcarbon fixation and nitrate reduction rates. In addition, they studied activity at ‘Crab Spa’, a diffuse flow vent site that has been used by the investigators as a model system to gain insights into chemoautotrophic processes and has been frequently sampled over the last several years. The final Alvincruise of 2014 visited the Dorado Outcrop off Costa Rica in December for sampling and quantification of flows from cool yet massive ridge-flank hydrothermal springs. Investigators from the University of Alaska located and sampled low temperature sites using the submersible and multibeam bathymetry. The vessel ended the operating year transiting to Arica, Chile. The submersible operating year began in late January with five qualifying dives off Arica, Chile to officially extend Alvin’s depth rating to 4,500 meters. NAVSEA auditors accompanied the operations team as dives to successively deeper points demonstrated submersible capabilities and readiness for full certification. Non-Alvincruises and a long transit took the ship around Cape Horn and back to Woods Hole by mid-April. After a support ship maintenance period and short transit to Florida, the first Alvinscience cruise left St. Petersburg in mid-June for 15 days of sampling of hydrocarbon seeps and surface oil slicks in the Gulf of Mexico. 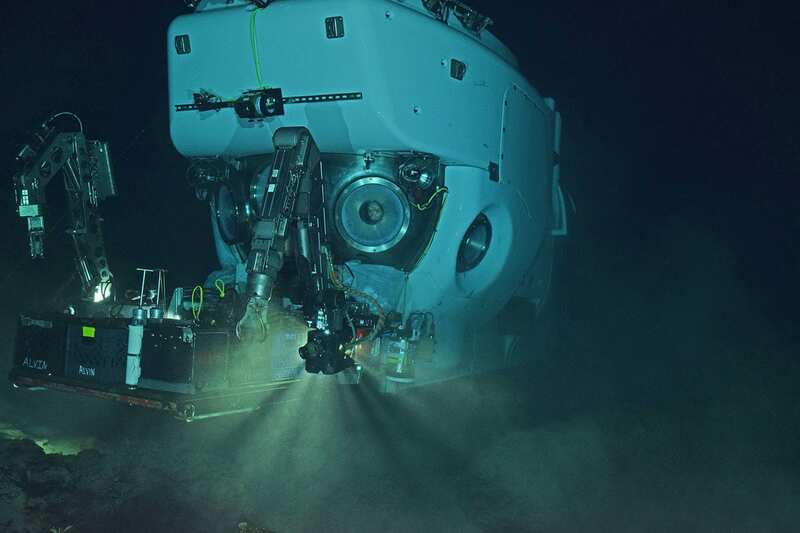 Operations involving investigators from WHOI, UCSB, and the College of William and Mary took place at a number of seep locations, in water depths of 700 to 3,500 meters. Several targets were identified, ranging from the Louisiana slope to the Texas slope, within 250 nm of 26N 91W. AUV Sentrywas also used for mapping and imaging dive targets and for dive planning. Multibeam sonar was used to image study areas and to identify gas plumes in the water column. Sediment was collected by gravity coring. A short transit around to Morehead City, NC allowed the next science party to embark in early July. This 21-day cruise saw scientists from Duke University characterizing hydrography, larval abundance and distributions, and population genetics of seeps in the intra-American sea to determine processes and dynamics of connectivity. This work included mooring deployments of 1-year duration at seep sites located on the Blake Ridge/Atlantic shelf off the east coast of the United States. Investigators sampled benthos at seep sites (including new seeps located off Nantucket and Virginia) for reproductive biology and genetic analysis and sampled the water column at the seep sites with a MOCNESS net system. They also employed telepresence equipment for outreach in collaboration with the URI InnerSpace Center. 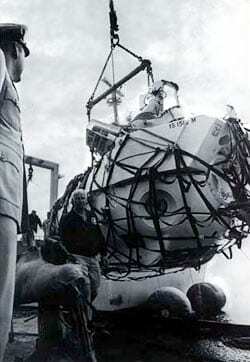 Upon return to Woods Hole at the conclusion of the cruise, the submersible was offloaded and installed in the maintenance facility at WHOI. NAVSEA conducted a functional audit of both the sub and its launch and recovery system aboard Atlantisin early August. For the remainder of the year Alvinunderwent scheduled maintenance and upgrades to various systems in Woods Hole. Alvinbegan the year undergoing scheduled maintenance while our support ship Atlantiswas in the shipyard. After a transit from Charleston, SC to Barbados, the first science cruise utilizing the submersible left Barbados in early March bound for the Mid-Atlantic Ridge. WHOI investigators used the submersible for rock collection and seafloor observations during this nearly month-long expedition, and also employed AUV Sentryfor seafloor mapping. The AlvinObservation Vehicle (our remotely-operated camera sled) was used by a team from the National Transportation Safety Board in late April to search for the vessel data recorder from the sunken merchant vessel El Farooff the Bahamas. The AOV and AUV Sentrywere able to locate the recorder amid the wreckage and mark its location for subsequent retrieval by the Navy. After transiting the Panama Canal in September, scientists from the University of Minnesota used Alvinto deploy mobile chemical sensor systems in diffuse flow vent fluids at East Pacific Rise (EPR) 9°N. pH/redox probes were also deployed at nearby high temperature vents for studying in situchemical conditions in the deep reaction zone. During that same cruise investigators from the University of South Florida collected Riftia pachyptilatubeworms for shipboard experiments to elucidate the pathway of carbon fixation by their chemolitho-autotrophic symbionts. The next cruise visited the 8°20’N Seamount chain, located west of the (EPR) Siqueiros transform fault ridge-transform intersection (RTI), to test models of melt production and transport. Scientists from the University of Illinois studied the formation of off-axis oceanic crust and the development of near-axis seamount chains, and tested models of melt distribution and extraction, all of which are fundamental first-order processes associated with the formation of oceanic lithosphere and the evolution of the upper mantle. The Alvindiving and dredge plan was dictated by the findings of our multibeam and derived sidescan surveys, as well as reconnaissance using TowCam. Investigators devoted Alvindives to each of the largest volcanoes at distal, middle, and proximal locations (with respect to the EPR axis) in order to better constrain whether magmas feeding them were of similar compositions throughout their construction (i.e., sampling summit and basal edifice lavas, or on flank-scarps that may expose older flows). In December the ship and submersible traveled north to Guaymas Basin, where researchers from the University of North Carolina performed an integrated microbiological and geochemical study of hydrothermal sediments. Dives to the hydrothermal vent fields in the Southern Trough at 2,000 meters depth recovered sediment cores, microbial mats, and marine invertebrates from the hydrothermally heated sediments. The diving season ended in late December in Manzanillo, Mexico. Two non-Alvinscience cruises were conducted off the coast of Chile at the beginning of 2017. A skeleton crew of Alvintechnicians performed routine maintenance at sea during this period. In early March the ship transited from Arica, Chile to Puntarenas, Costa Rica. Four submersible engineering test dives were undertaken in waters off Peru and Costa Rica prior to making port. The first science voyage began in late March, taking University of Delaware investigators to the East Pacific Rise at 9°N for sampling of hydrothermal vents and the water above vents, specifically looking at pyrite, metal sulfide, and aluminosilicate nanoparticles as kinetically stable sources of iron and other metals in the ocean. The next cruise left Manzanillo, Mexico in late April and took the submersible and WHOI scientists back to the East Pacific Rise for collaborative research on environmental drivers of chemoautotrophic carbon production at deep-sea hydrothermal vents. Next up was a 23-day voyage to the Costa Rica Seep area, where Temple University investigators attempted to quantify the biological, chemical, and physical linkages between chemosynthetic communities and the surrounding deep sea. AUV Sentrywas also deployed during this cruise. The final submersible dives of the season were five engineering descents during the transit from Puntarenas, Costa Rica to Woods Hole, one to our test depth of 4,500 meters. Alvinpassed a US Navy functional audit and certification survey in August, and began a seven-month open period shortly thereafter. Expedition Leader Pat Hickey becomes just the second submersible pilot to dive more than 500 times in Alvin.